The European Union has brought out a new legislation under which food and drink manufacturers will have to prove scientifically the health and nutritional claims they make for their products. The legislation would prevent labels that extol virtues attributed to many foods and food supplements we eat such as being low in energy, fat free or high in protein - unless the labels fully comply with clear standards. Similarly vague terms such as "preserves youth", "improves memory" and "reduces calorie intake" that cannot be substantiated, would also be banned. In Canada, new regulations published on January 1, 2003 make nutrition labelling mandatory on most food labels, update requirements for nutrient content claims and permit diet-related health claims for food. These regulations coupled with education are significant supports to improved public health. Coming to the Indian scene, we do not have proper food labels on many ready-to-eat products, let alone nutrition labelling! Ever since foreign branded food products came to India with the nutrition labelling, some of the Indian companies have made claims about health benefits from their food products. Since we do not have nutrition labelling regulations yet, the consumer cannot be sure how much of the claim is true. This raises a number of questions and doubts. If the food label claims health benefits, does it mean that the consumer does not require advice from a health professional? If a product claims to supply some nutrients, how does the consumer know how much of those nutrients she requires? If a product gives some of the required nutrients, does it mean that no other foods can give the same nutrients? As per US guidelines (since I'm not aware of Indian guidelines yet), a nutrition label should have serving size, percentage of daily value of the nutrient, quantity of macro nutrients per serving, a few micronutrients and so on. A food that is "high" in a nutrient should contain 20 per cent or more of the nutrients daily requirement. The term "low" would describe a food that has no more than 3 gms fat, 1 gm saturated fat, 140 mgs sodium, 20 rugs cholesterol or 40 calories per serving. A "light" product should contain 50 per cent less fat, or 50 per cent less sodium or 33 per cent less calories. Are we getting truthful nutrition information from Indian labels? Even if we are, can a consumer be misled with the information? For example, a "sugar free" product might not contain sucrose but contain sugar alcohols (sorbitol, mannitol) or sugar substitutes. Not all sugar substitutes are calorie free. Vegetable oils, which claim that they are "zero in cholesterol", are not lying because none of the vegetable oils contain cholesterol. However, a consumer may get the impression that one oil is healthier than another oil because of this claim. This may lead to excess consumption of a particular oil with the zero cholesterol claim. It's good for the oil company's business, but not so good for the health of the individual. 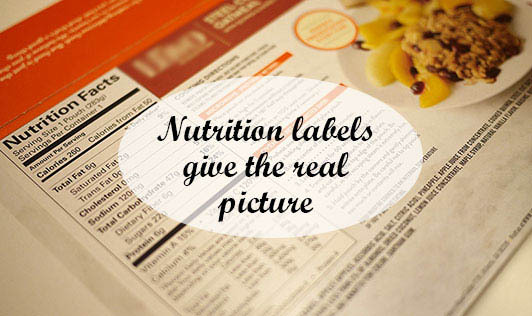 With an ever-increasing demand for and availability of ready-to-eat foods, nutrition labelling is the need of the hour.